Owning a swimming pool brings enormous responsibility to the homeowner. Aside from the liability issues, there is the maintenance, upkeep, and cleaning, which can consume as much time as the enjoyment of the pool itself. 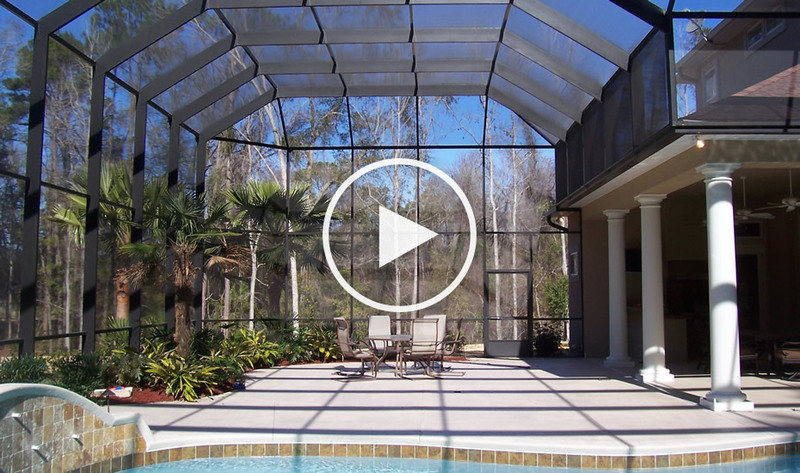 Enclosing your swimming pool with a pool enclosure dramatically reduces maintenance, allowing you and your family to realize your dream of using your pool at any time, day or night, while also addressing liability issues. And in this day and age of mosquito-born illnesses, like zika virus and encephalitis, a pool enclosure can save more than just time. Swimming pool enclosures are attractive additions to your home which vastly expand the home’s footprint and provide outdoor living space which goes beyond providing a protected swimming area. 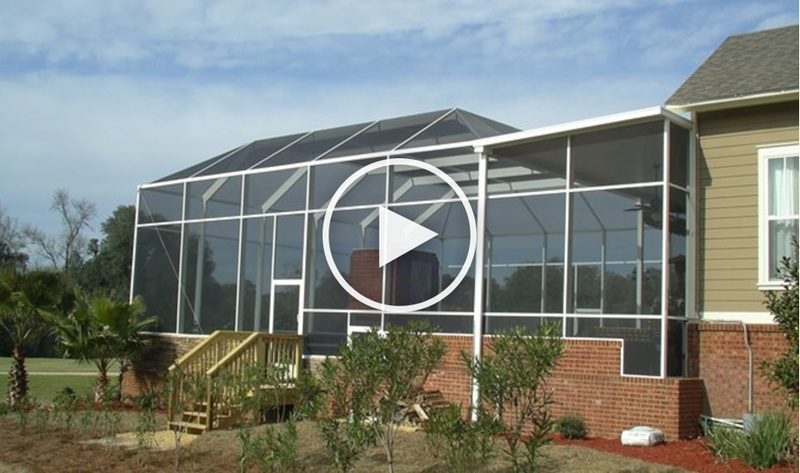 Enclosures also provide a clean, bug-free environment for entertaining, cooking, and parties. And they also provide the ability to simply walk outside and use your pool without the worry and hassle of cleaning, sweeping, and skimming the pool just in order to swim. 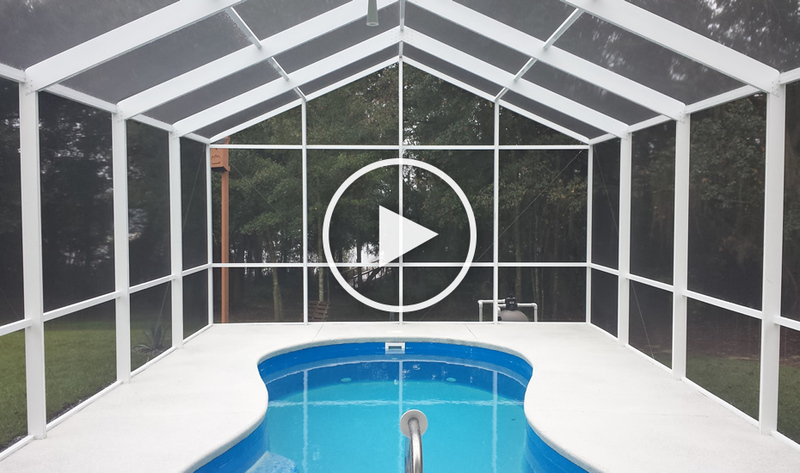 Pool Enclosures come in a myriad of different designs. When deciding which design is best for you, it is helpful to familiarize yourself with the qualities of the various designs and choose one which works best for your circumstance. Generally pool enclosures break down into several distinct shapes. Gable roof pool enclosures come to a peak in the center. The amount of rise achieved by a gable depends upon the pitch and span, but is generally 4 to 5 feet. But that maximum height is only achieved at the peak, and is lost as the span approaches the wall or house. Thus, other designs, such as the mansard, contain more volume for the square footage than the gable. Another important thing to remember about the gable is that the peak will be defined by dividing the distance from the attachment point against the house (or the distance between the two walls in the case of freestanding structures) into two equal parts and sloping both divisions at the same degree. When an enclosure attaches to a house it typically does so at the overhang, to which we mount a strong, structural extruded 7 inch gutter called a “super gutter” Thus, the peak will be biased away from the home by a small amount because the overhang and super gutter make the roof measurement less than the wall to wall measurement. Also, most pool buyers concentrate the lion’s share of the concrete between the house and the water, leaving a smaller amount of concrete on the opposite side of the pool, which means a point which is centered as above would typically not line up with the center of the swimming pool itself. Therefore if creating an enclosure which centers on the pool is important to you, it would be necessary to plan ahead to create the right measurements in the pool design. There are different ways to terminate the ends of a peaked structure. Most gable pool enclosures end in what is called a “hip” style. This is where the walls al remain at a constant height all the way around and the peak is connected to the wall via a series of sloping aluminum members. There is also a design where the shape of the roof extends all the way to the ends and terminates in a peaked wall. We call these designs “true gables”. Keep in mind that the gable hip design creates a more curved, conical shape at the hip, whereas the true gable is more angular. 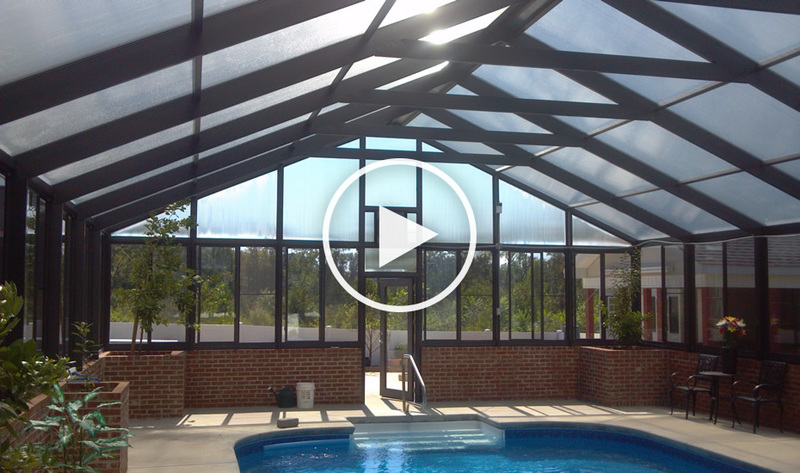 By far the most versatile and adaptable pool enclosure roof design is called a mansard hip. This design slopes up for one division, comes across level for one or more divisions (depending on the span), and drops down again for one division. Key to this design is the congruency between the width of each division and the angle of the slope being the same for all sloping members. Since all the sloping members slope at the same degree for the same distance, they all terminate at the same height. What makes the mansard roof more adaptable, and especially different from gabled screen roofs is that the level portion connecting the sloping members can change length without altering the height. This provides flexibility to cover swimming pool footprints which may not be square. Aside from its versatility the mansard screen roof has other virtues. Because its sloping members are pitched at a steep 30 degree angle, it achieves approximately the same overall height as a similar gable roof, but affords that height throughout a larger area of floor space, yielding a greater interior volume for a given footprint. This added volume make the mansard roof style feel larger and more open than other roof styles. Many of our customers seeking to enclose their pool do not realize that it is possible to integrate areas of solid cover into the design of the enclosure. But these “combination” style enclosures are not only possible, but represent an opportunity to increase the utility and enjoyment of outdoor living space at a cost which is a fraction of that of working with traditional wood framed solid roof additions. And since they integrate seamlessly with the screen portion of the pool enclosure, the aesthetic appeal of the project as a whole is improved. Typically, combination style pool enclosures incorporate our solid insulated composite aluminum roof system which attaches to the eave of the home. This high strength, walkable roof system affords a rain proof environment which serves as an intermediary element between the house and screened portion of the pool enclosure. The interface between the solid and screen portions consists of a carrier beam and structural super gutter combination that is almost entirely open, so that there is no impediment to the flow of movement between the solid and screened area. These structural insulated composite roof systems are widely used in the green building industry because of their superiority to old fashioned wood frame roof systems and their environmentally responsible composition. But there is more going for these composite roof systems than just their hallmark eco-friendly status. They allow you to save money and increase the aesthetic appeal of your enclosure while streamlining the overall design of the structure. Consisting of a high density insulated core clad with an embossed aluminum top and bottom layer, these roof systems combine all the features of a ceiling, attic, and roof in a compact and strong package. They look great, insulate very well, and provide a reflective element which, taken together, afford the Energy Star designation for efficiency. And because they support weight, unlike the old non insulated systems, maintenance is a breeze. Because the engineering characteristics of composite panels are superb, they can span great distances. The standard 3 inch thick system can span almost 17 feet, and greater spans can be achieved by increasing the thickness of the insulated core or the aluminum “skin” which surrounds it. Depending on the configuration, these systems are capable of spanning up to 30 feet! But in most cases the standard thickness panels are sufficient to do the job, which helps to make these roof systems very economical. Moreover, the benefits of using composite aluminum roof systems go beyond their energy efficiency, structural qualities, and eco-friendliness. They also allow installations to proceed more quickly and with less hassles than working with wood. Because All Custom Aluminum installs these systems at the same time as the screened enclosure portion of the job, these roof systems install in as little as one day, not weeks. And since the materials are all matching in finish and design, the whole project looks more consistent and planned. While keeping pool enclosures square or rectangular definitely simplifies the overall design, there are many instances where either the attachment to the home or other contingencies dictate that a more complex shape is needed. Hybrid screen roof systems accomplish this by integrating elements of multiple roof styles, or multiple spans of the same roof system, into one synergistic whole. Mansard style pool enclosures can be made to span two or more areas of different widths. Gables and mansard roof styles can be integrate to wrap around corners. And oddly shaped areas with angled perimeters can be enclosed without resorting to delineating out rectangles with the use of carrier beams, which translates into better, more aesthetically pleasing designs. 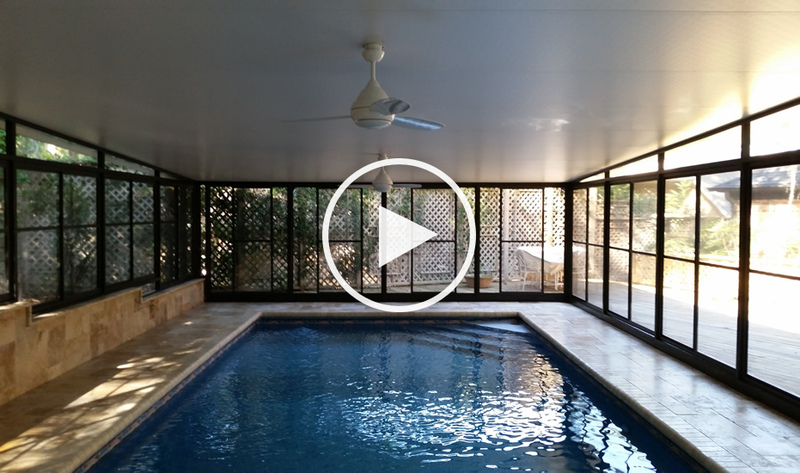 For those looking for a completely enclosed swimming pool which affords rainproof, all season protection, All Custom Aluminum offers a line of solid pool enclosures. If you are looking to keep out the rain, we offer a polycarbonate insulated roof which allows light to pass through while keeping you dry inside. We also design and build enclosures which utilize structural insulated composite roof systems for those concerned with sun exposure. Either product allows the enclosure of the open walls with a window system which can complete the insulation of the space. Polycarbonate roof systems are comprised of a high strength ply of polycarbonate on the underside and top of the sheet with an insulative, tubular core. The panels can vary in thickness and are engineered to apply to an aluminum framework much like screen. Many times stronger than glass, this high quality material sheds water while letting sunlight through with superb clarity. Some customers want a more interior feel, which we provide by utilizing structural insulated panels. Typically, these enclosures utilize a 6 inch thick system with heavier gauge aluminum cladding. By adding skylights, these enclosures can provide plenty of natural light while protecting those inside from weather as well as harmful UV rays. And, like the polycarbonate roof systems, having a structural insulated roof affords the option of a series of windows and doors along the walls for full four season use.